Find out which fish to choose for your 10-gallon tank, how many fish to stock and more! A 10-gallon fish tank presents a wide array of possibilities for stocking pretty, vibrant fish. If you choose wisely, your aquarium will become a healthy ecosystem and your fish will live long, happy lives. Unfortunately, with a tank this small there is also the possibility of making some serious mistakes. If you don't completely understand the needs and temperaments of your fish you could end up with some aquarium inhabitants who have no business in your 10-gallon tank. This will lead to premature death for your fish, and heartache for you. Don't rely on staff at your local pet store to help you make the right choices here. Some are very knowledgeable, but others have no idea what they are talking about. Worse still, sometimes the little cards on the front of the display tanks that are supposed to give you information about a fish can be flat-out wrong. So how are you supposed to know which fish to choose for your 10-gallon tank? You do your own research. Reading this article is a good start! Here you will find some information on good fish to stock, and others you ought to avoid. But don't stop there. Learn as much as you can about your fish and aquarium care. It takes a little work, but it will make the hobby much more fun in the long run. Also, keep in mind that just because some fish are appropriate for a 10-gallon aquarium doesn't necessarily mean they are easy to care for. If you are a newbie to fish keeping you may want to check out this article on the Best Tropical Fish for Beginners. So how do you decide how many fish you should put in your 10-gallon tank? You research the fish you are interest in, and learn as much about them as you can. This way you will know their care requirements, space requirements and temperaments. It takes a little work on your part, but there really is no better way. You may have heard a "rule of thumb" that suggests one inch of adult fish per gallon of water. Therefore, if you wish to stock fish that reach an adult length of one inch, you can have ten of them in your tank. That makes enough sense, but what if you choose a pair of five-inch fish for your 10-gallon tank? How about one nine-inch fish and a one-inch fish? Or, a single ten-inch fish? Those are silly examples, but hopefully the point is made that this "rule of thumb" isn't worth a whole lot of thought. It's much better to do some research and understand the fish you plan to stock rather than rely on a simplistic method that doesn't take their needs into consideration. The following fish are good choices for your 10-gallon aquarium. Remember, when deciding how many to stock be sure to consider the other fish you plan to have in the tank. Under ideal conditions most of these fish ought to live peacefully with each other, but remember that no situation is typical. If you overstock your tank, or if it simply turns out two fish aren't getting along, you may need a backup plan. Also, hopefully it's clear that I'm not suggesting all of these fish should be in your tank together at the same time. Learn about the fish and decide how to mix and match your stock. Cories are spunky little bottom-feeding catfish that only grow to about 2-3 inches in length. They're peaceful, fun to watch, and best of all they serve as the "clean-up crew" for your tank. Cories subsist on food that falls to the bottom of the tank. You may wish to provide them with sinking pellets to make sure they are getting the nutrients they need, but generally they will scavenge anything edible that falls into their domain. They are schooling fish, so they're happiest when there at least six of them together. Neons are small, vibrant fish and a school of them really makes a tank pop. Like cories they prefer to be with more of their kind, so plan for a small school. However, if you intend to have a neon-only tank you can go up to 10 or so in a 10-gallon aquarium. Make sure your water conditions are pristine and don't overcrowd them. Even though they are docile toward other fish species, they can get nippy at each other when stressed, and this leads to death in their ranks. These mini-gouramis have been bred to exhibit some beautiful colors, and you can find some amazing blues, reds and oranges if you choose wisely. A pair of these in a planted 10-gallon tank would make for an amazing setup. However, be aware that these guys are considered a semi-aggressive fish species, and there can be trouble if one decides to pick on the other. Be sure to include hiding spots and plenty of decorations in your tank in case one becomes dominant. A guppy tank is lively, colorful, and a lot of fun to watch, and like neons you can have a bunch of them in 10-gallons. 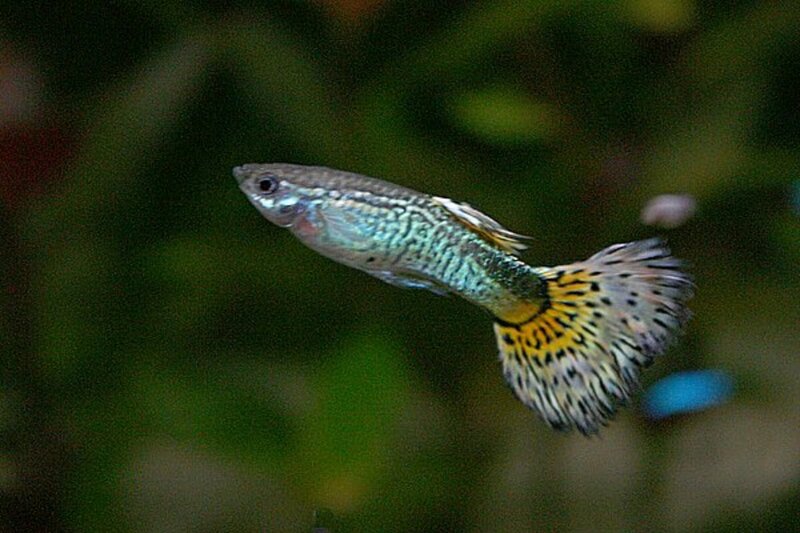 Fancy guppies comes in many different colors and you can really get creative when choosing your stock. They are active swimmers in the top third of the water column, so they don't require much in the way of hiding spots and decorations, especially if they are in a species-only tank. Be careful if combining them with other fish species, as they can become lunch for bigger tankmates! Contrary to their reputation as the kung-fu wrecking machines of the aquarium world, Betta can live in a community tank with other fish in certain situations. The key is understanding their behavior, keeping a close eye on things and having a back-up plan if things don't go well. That said, I do not think a 10-gallon tank is the right environment for keeping Betta with other fish. But they may do well with certain critters such as Apple Snails or Ghost Shrimp. A single Betta in a planted 10-gallon is a great setup, for him and you. 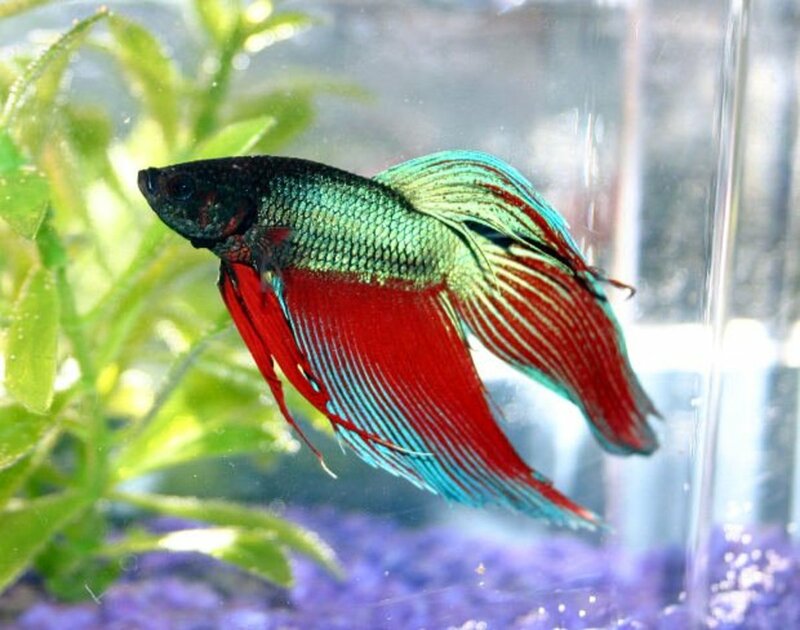 Of course it should go without saying that you should never, ever, put two male Betta fish in the same tank together. Just as you can make some really good choices when stocking your aquarium, you can make some dumb ones too. Try not to feel too bad about it if you do. We've all made stocking mistakes, and it's always a learning experience. Some fish inappropriate for a 10-gallon tank get into this situation when they are purchased by aquarium owners who either didn't know any better, or were misled by pet-store staff. Sometimes parents, in an effort to please kids, end up buying inappropriate fish. Perhaps, instead of giving in to the child, this should be seen as an opportunity to educate them on respect for animals and proper care. However they get there, these five fish often end up on the short end of the stick. 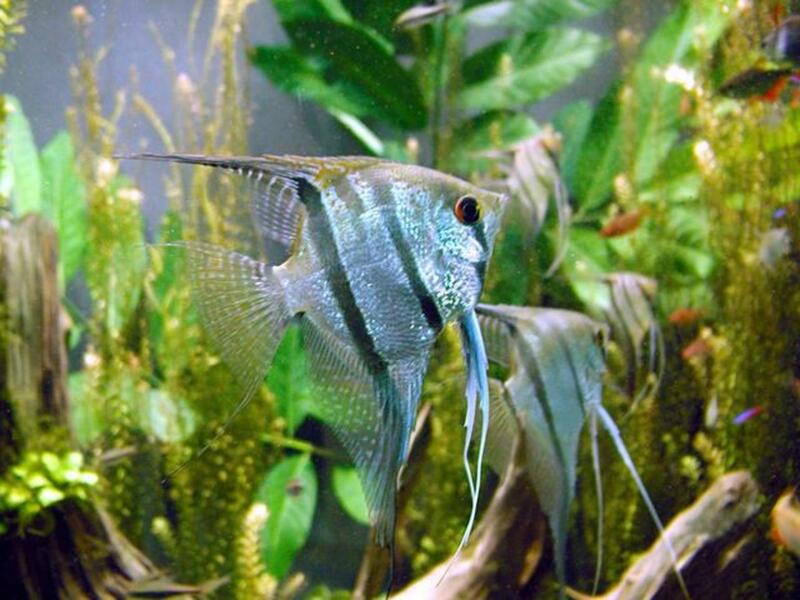 Baby angelfish are adorable, and it can be tempting to add a couple to your tank. But these guys grow over a foot tall, and their adult size is much too large for a 10-gallon aquarium. 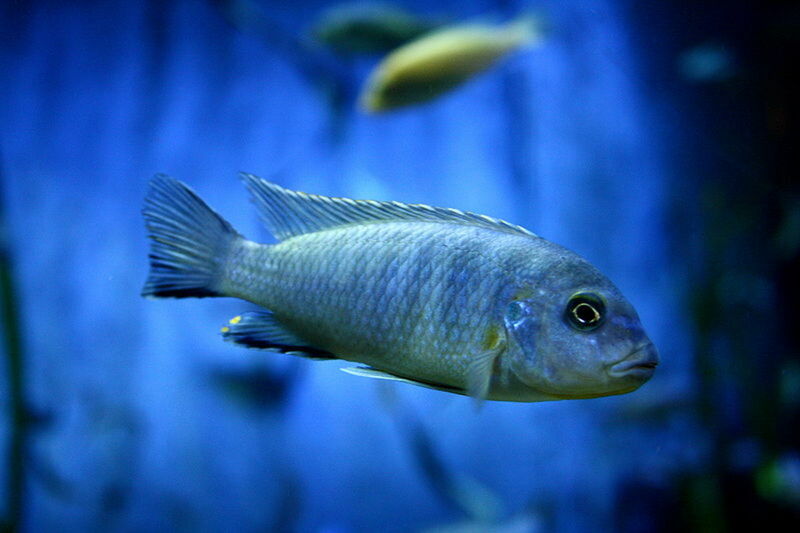 In addition, they are aggressive, new-world cichlids best housed with similar large species, or in species-only tanks. If you want angelfish, consider a tank 55 gallons or bigger. Next to the Betta fish, the bala shark is possibly the most abused aquarium fish out there. They start out as cute little three-inch fish and end up in some kid's 10-gallon tank because they are so cool. But bala sharks grow a foot long and need to be kept in schools. They are fast-moving, powerful fish that are easily startled, and there are even rumors of spooked adult Bala sharks cracking aquarium glass. Unless you have a truly massive tank, these guys don't belong in your home aquarium. Dwarf gourami can do fine in a small tank, but their bigger cousins should be avoided unless you have the space to care for them properly. Gourami are large, aggressive fish with complex behaviors, and a pair should be kept in no tank smaller than 55 gallons. They may be colorful and attractive, but if you add them to your small tank you'll get more than you bargained for. When it comes to plecos, you a really need to know what you're getting yourself into. This is the fish commonly thought of as the "sucker fish". Most species grow very large, up to several feet - way too big for most aquariums. They require driftwood to rasp on, and will demolish any live plants. They also don't do as good a job of cleaning algae as typically thought. If you want a more tank-friendly algae eater, skip the pleco and consider a small school of Otocinclus catfish instead. 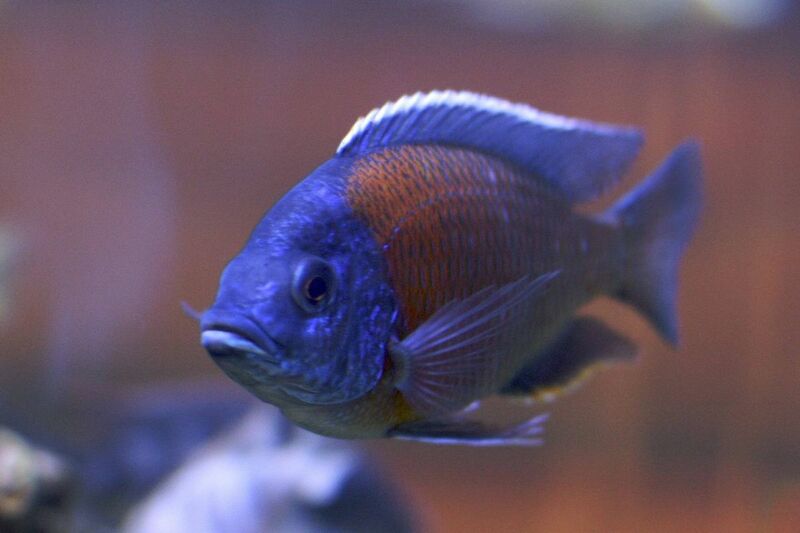 African Cichlids are the closest thing you can get to the vibrant colors of saltwater fish in a freshwater environment. Some aquarium owners specialize in cichlids, and they make for some beautiful tanks. But they are also very aggressive, very complex fish and, except for a few species, do not belong in a tank smaller than 55 gallons. Even then you need to know what you're doing to prevent them from killing each other. Don't let their pretty colors lure you into popping a couple into your 10-gallon tank. They are not appropriate, and they can potentially devastate any tropical fish you already own. When I was around seven or eight years old my family got our first 10-gallon tank. We took advice from the owner of the pet store when stocking it, and, thinking back, the guy was either nuts, stupid or just trying to sell a bunch of fish. I know now this was a very poorly stocked tank. But my parents didn't know any better and they trusted this guy to guide them. The point is, don't rely on the staff at the fish store to tell you what is right. Do your own research and learn what's best for your aquarium. Back then there was no internet, but today you have everything you need at your fingertips to learn about any fish species you have in mind. Understanding the temperaments and care requirements of the fish you intend to stock is the most important factor when it comes to running a successful freshwater aquarium. It's smart to have a manual handy to help you find the root of challenging behaviors and choose the right fish for your tank. Algae growth in the aquarium is the bane of many a fish keeper. Learn how proper tank management can get rid of algae once and for all. What fish can I keep with my goldfish? In most cases, goldfish kept in aquariums should not have tankmates. There are a few reasons for this. 1. Because of their physiology, goldfish pollute their environment very quickly. While they can tolerate their own selves, tropical fish will struggle alongside them. Tropical fish require cleaner water. 2. They are cold-water fish. The ideal water temperature for goldfish is about 10-15 degrees cooler than what is best for tropical fish. This means, if you have goldfish and tropical fish together, one or the other will be under constant stress. 3. Goldfish require larger tanks than most people realize. Every species of goldfish grows too large for a bowl, or even a 10-gallon tank. The minimum tank size is 20 gallons for a single fish, with an extra 10 gallons for each addition fish. Unless you have a very large tank, you really shouldn’t have a bunch of goldfish, unless you expect to re-home them to a pond as they get larger. 4. Finally, most goldfish have long, flowing fins. Many fish will nip and them, causing them stress. So, in summary, it is best to keep goldfish alone. If the tank is large enough, they may live with other goldfish, but they should not live with tropical fish. I just want one fish. Which one would you suggest? 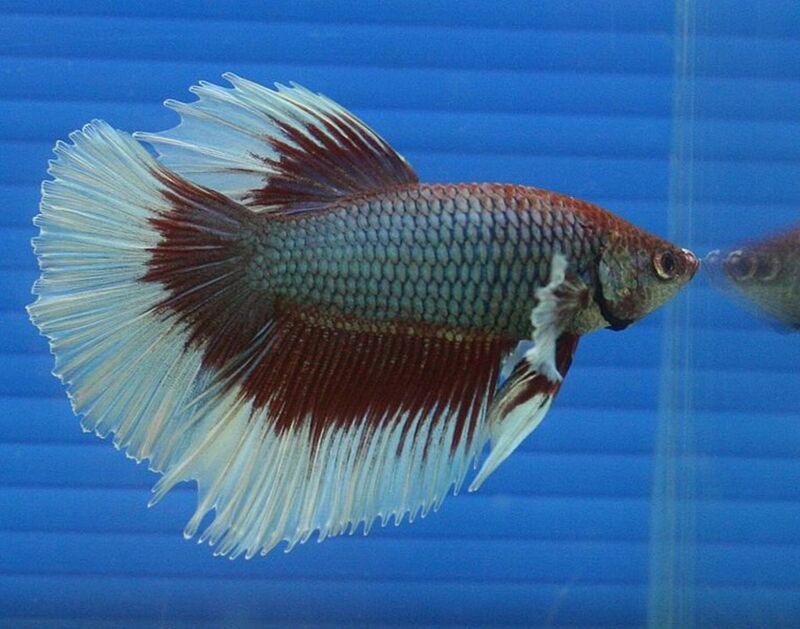 A single male betta is the perfect resident for a 10-gallon tank. Make sure the current is gentle and that he has proper heat and filtration. Include some plants, real or artificial, and some caves or decorations for him to hide in if he feels the need. You will have plenty of room to aquascape, and he will have lots of space for swimming. You can even have some critter tankmates such as an apple snail or some ghost shrimp if he is willing to tolerate them. If you are willing to consider a larger tank, you have several more options. A green spotted puffer will need a 30-gallon tank (minimum) and brackish water, but they are great for single-specimen tanks. They do have some unique care requirements, so read up on them before purchasing. For even bigger tanks, the oscar is a popular choice. These are large, aggressive new-world cichlids. You will need a least a 55-gallon tank, but bigger is better for these guys. Like the green spotted puffer, make sure you do your research before committing to keeping an oscar! Do you need a special stand for a 10-gallon aquarium? While you are smart to use a special stand for a large aquarium, some people place small tanks that are ten gallons or under on a regular table, desk or shelf. That’s fine for many small tanks. However, it is extremely important that you understand the real weight of an aquarium before making this decision. A gallon of water weighs a bit less than 8.5 pounds. This means you can expect your fully-decorated 10-gallon tank, with hood, lights, filter, gravel and everything else that comes with it, to weigh around 100 pounds. That’s way too heavy for some shelves, desks, and tables. Remember, the stand you choose for your aquarium must hold that weight all day, every day. Unless you are absolutely sure the place you choose for your tank can safely support its weight, you may feel better using one of the special stands designed for aquariums. I have a ten-gallon tank. Can I fit two Pictus catfish in it? I advise against it. Pictus catfish do not grow very large, but they are shoaling fish and should be kept in small groups of half a dozen or so. A ten-gallon tank is too small. I would not keep them in anything smaller than a 55-gallon tank. You could have small school or cory catfish in a 10-gallon tank, though. Corydoras and guppies generally like harder, slightly alkaline water while the rest like soft acid water. So I would not keep them with the other fish. I would replace a corydoras in a soft acid tank with loaches. 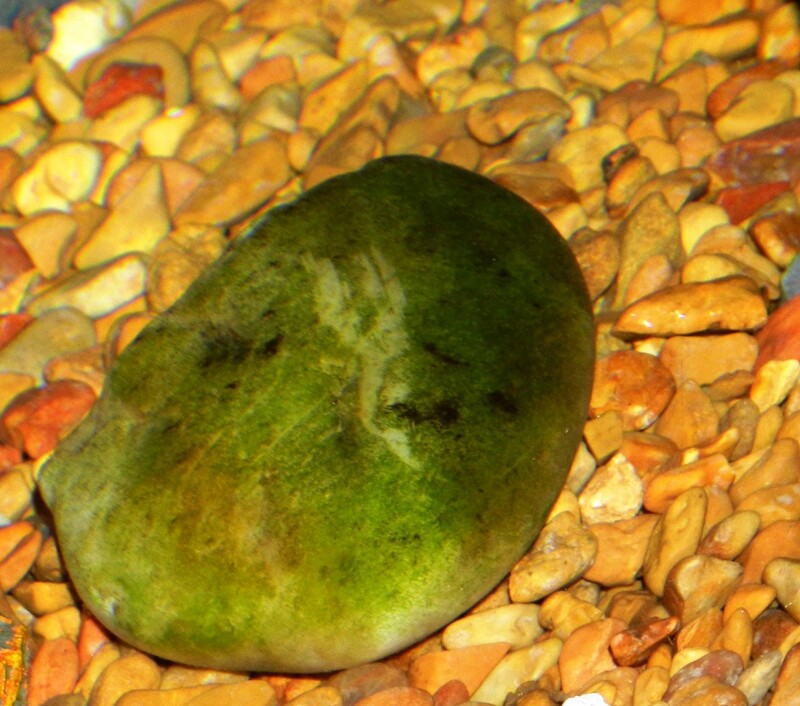 A good algae eater in a small tank is a small plecostomus type fish. Ancistrus (bristlenose) catfish are small and ideally suited to a 10G. I had a pair which bred in the tank successfully (the kuhli loaches in that tank bred too). The one in there now is the last of that litter. Ancistrus are eager algae eaters but will also appreciate a blanched lettuce leaf weighted down with a lead strip or a thick slice of blanched zucchini also weighted down (I cut a slot and fit the strip through it). @Red - I think you are okay with your fish or any listed above in a half moon. However, if you were talking about a long tank, they are more shallow and often better suited to specific species. Do your suggestions for best fish for a 10 gal change with the shape of the tank? I just decided to downgrade from a 20 gallon rectangle to a 10 gallon half-moon. I have barbs and neons. The one inch of fish per gallon is a fallacy, what you want to look at is the bio-load of the fish and the size tank they'll need as an individual fish when they are fully grown. Which you kind of pointed out. These guys do best in schools of 4+ and in a footprint of a 20USG long or more. They also do well on a sand substrate to lower the risk of injury to their barbels. They do clean up to an extent, they are bottom feeders and will check out left-over food that falls to the bottom but they don't clean up, they will make waste themselves. As with ANY animal that is living in your tank it will need its own diet. These guys are cute and one of my favorite stocks to fill a tank with. There is a disease that is common amongst them called neon tetra disease, caused by an organism called Pleistophora hyphessobryconis. They're also just in general rather susceptible to disease and are known to be rather 'fragile' among many hobbyist/keepers. So long as you quarantine fish, and do your acclimations to each tank they are in they should do alright. I had some live over ten years and it was pretty awesome. I wouldn't put more than 12 in a ten gallon if it is just those fish alone. Yes, they are semi-aggressive. They're in the same family as betta and have a labyrinth breathing organ just like the betta do :) These I typically suggest one per tank and try to choose dither fish that won't be too much for the gourami, either. Danio are too fast and nippy and get rather large for 10 gallons, chili rasbora, pearl danios and ember tetras typically do well and you could use about 6-8 of them for the tank. Make sure you're getting the dwarf and not another species that gets larger :) Sometimes they are mis-labled [even during shipping sometimes the shipper mis-labels a thing..frustrating to say the least lol]. They exhibit a lot of interesting behaviors, and use their 'feelers' for a lot of different things! 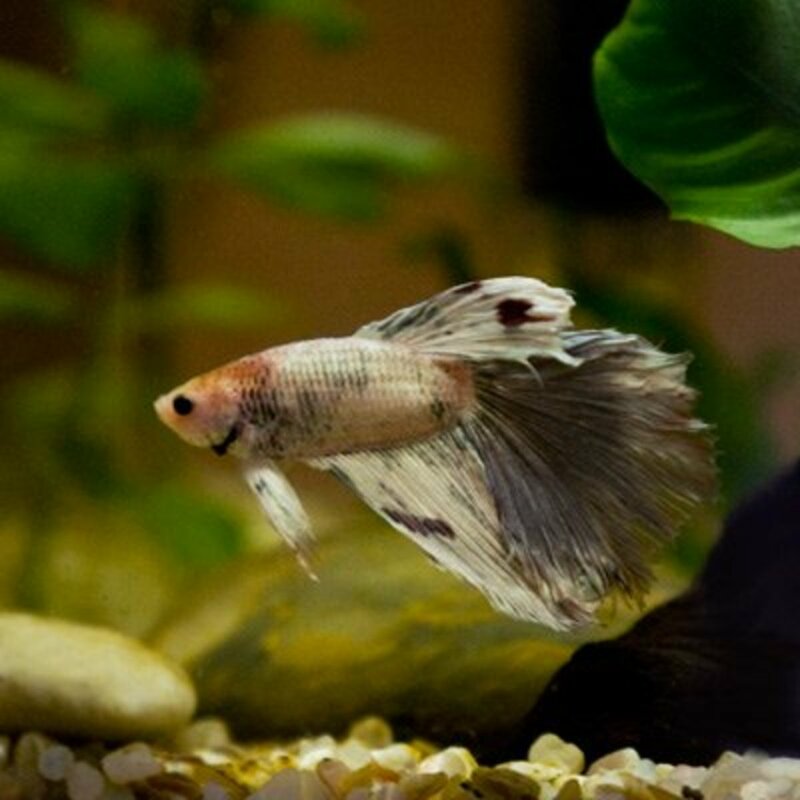 These fish also have a lot of similar behaviors to betta but not as obvious and not as aggressive, it's more in the simple nuances of how they are. Guppies you typically want to stick to all male, or all female. If you combine male and female you want at least three females to each male or they'll become overly aggressive in trying to breed and can possibly kill the female if there are too many males. Even just one male should have the same ratio as aforementioned. I would suggest that even though they are typically at the top, they venture around too. Any fish needs somewhere to swim, somewhere to eat, somewhere to rest/hide. Give them some guppy grass, a nicely planted tank or silk plants, little things to go through and explore. They need stimulation just like anything else. A ten gallon planted set up would be most ideal for these guys as stated. Hit or miss with the shrimp and I would opt for a horned nerite than an apple, as snails definitely have a quite a large bio-load for their size. Shrimp, if they can work, are a lot of fun to watch and love plants and driftwood and the like and they have their own set of little needs. Once you start digging into the world of shrimp you learn a lot more about them and their needs-I'll leave all that up to you all to research the different species and their needs. :) They can definitely go into community tanks, the color of the fish doesn't matter but rather the fin length and aggression level of the other fish. 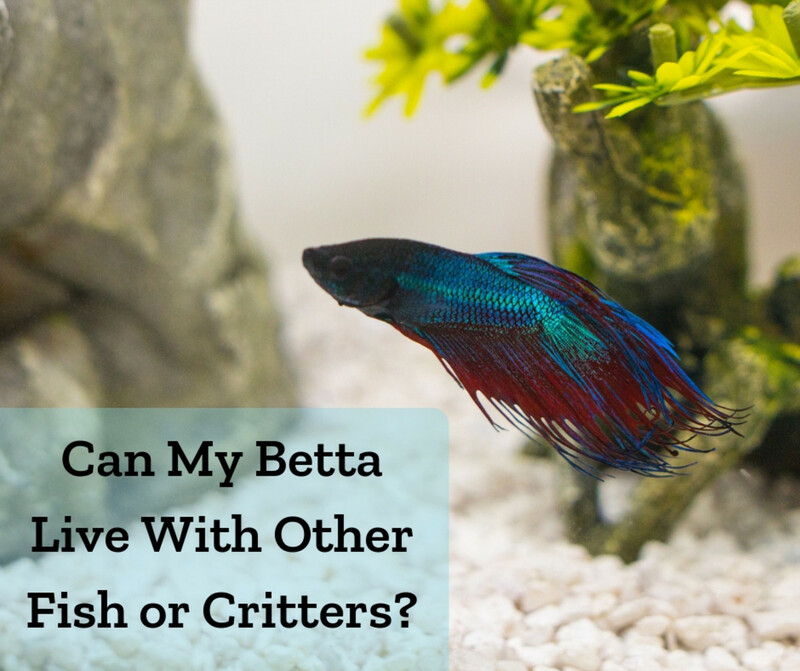 You WILL of course have a higher risk of the betta just being aggressive and not want roommates at all. I suggest to always start small with a few shrimp or couple of fish and see how the betta does. You can always float the betta in the tank while you're adding the new roomies as well, and maybe even re-arrange the tank some so that established territories are no longer a thing for the betta to fight over. Otocinclus - they prefer groups as well and do best in 20-30 gallons, and any rasping fish should have some form of driftwood/wood to rasp on. The smallest "pleco" is in the ancistrus line. Bristlenose, rubberlip and clown plecos all need at LEAST 30USG. Those are the ones that I commonly see at most pet stores to be sold aside from the common plecostomus. Sorry if anything came off rude, just trying to add some tidbits of information. @Landon - You should have cycled the tank before adding fish. If you mean water changes, you can start doing them the week after you stock your tank. It is a good idea to get a gravel vac - small ones for 10-gallon tanks aren't very expensive. They make water changes easier. It's also a good idea to get a freshwater testing kit so you can know if you water is healthy or not. Sorry again but I’m a newbie so I have one more question. I got this 10 gallon tank about a week and half ago everything seems to be doing all right. But when should I start doing water cycles and should I get a aquarium vaccum I’ve seen a lot of people use one and they seem to do the job. @Landon - See if the store you bought them from will take them back. If not, check with other pet stores in the area to see if they can help you re-home them. We all make mistakes. It's always better to do your own research instead of relying on store employees. Good luck! Sorry again but I also forgot about a week ago I added an African dwarf frog and a female betta. I made a bad choice by going to Walmart to get fish advise about what fish gets along with who and what not and ended up with 1 angelfish,2 Redtail Sharks,and a black molly. As said in the article and some other research I’ve be seeing is that the angle fish is to big for a 10 gallon as well as red tails are very territorial I can see they chase each other around and nipping. I’m thinking to get rid of the angelfish and the red tails (at least one) where would I take them? @Luis - Please re-read this article and do additional research. Your tank is overstocked and you have a couple of inappropriate fish in there. For a 10 gallon is 3 ghost shrimp,1 pleco,2 mystery snail,1 beta and 5 neon tetra great or it to much wondering if this would be a great tank for a 10 gallon tank. @Anna - I think I the second idea better, but that's still a little tight in my opinon. For neons and cories you should really have at least 6 of each. Guppies should be in groups of three, with one male and two females per trio. Keeping two dwarf gouramis, six neons and three guppies along with the six cories is a little too much for a 10-gallon, in my opinion. I'd pick two - Gourami + 6 cories, or cories and neons, neons and guppies, whatever combination of two that you like. I am getting ready to stock a 10 gallon tank. Based on this article, I'm considering 4 cory catfish, 3 guppies, 3 neon tetras, and 2 dwarf gourami. Is this too much? Should I stick to 6 cories, 4-6 guppies or tetras, and 2 draft gourami? @Doug- That sounds good for a 10-gallon. I'm not sure I would add anybody else. I’m thinking about getting 6 Cory’s and 1 dwarf gourami. I’d like to know what you think about that and what you’d prefer along with your suggestions? @Aquarium space - My advice in this article was to stock no less than 6 so I'm not sure why you'd disagree with that. Do you think six is too many? If so, why? I respectfully disagree. You should never stock less than 3 cory catfish. They prefer to shoal in this minimum number. The otos would be fine, but, once again, the kuhli loaches are not. The dinosaur bichir needs a much, much larger tank than 15 gallons and will likely eat your other fish eventually. As I said before, please do some research before choosing fish. A quick search of their max size and care requirements can save you from major problems. Good luck! Yeah, I assumed pufferfish and by pleco I meant the rather smaller ones... the Oto Catfish. Could two of those possibly work? I did some research and figured I would get Kuhli Loaches, Oto Catfish, and maybe 1-2 Dinosaur Eels. @girl that wants eel - Those are not good stocking choice for a 10-gallon tank. Figure 8s are best kept in single-specimen tanks minimum 15g. That means alone, with no tankmates. They also require brackish water, where the rest of your fish are freshwater. No pleco can live in a 10 or 15-gallon tank. As stated in this article they grow much too large. Kuhli loaches also require larger tanks, and substrate they can burrow into. And, no fish is appropriate for a 1-gallon tank. I suggest you do you some research so you can make appropriate choices. If you are going to have a 10-gallon tank there are many appropriate fish, but the ones you've listed here are not. Good luck! Any suggestions to nice fish for a 1 gallon? Or should I get a 15-gallon and be able to stock in more fish? Hi Megan. I think I agree with the guy at the pet store. It's possible you added too much Safe Start, but it should correct itself over time. If it is still murky in a day or so you can do a partial water change if you want. Either way, let the cycle run and don't add any fish until it comes around. I agree with only adding a few at a time as well. I think you're on the right track there. As for which fish, you have a lot of choices. Zebra danios are hardy little fish, as are platies. There is a variety called "Micky Mouse Platy" that look like they have Micky Mouse on their tails. Not sure if that would be interesting to your son, but just a thought. Whatever you choose, do you research beforehand so you know they are appropriate for the tank you have as well as good tankmates for whatever else is in the tank. Complete newbie here. Our birthday boy (turning 8) asked for an aquarium for his birthday so we started a 10gallon yesterday. We used tap water, safe start plus and stress coat (as recommended by the pet store employee), we rinsed everything before starting and wiped the aquarium down. Everything was looking great when we got it up and running (no fish yet) but now, 24hours later, its completely clouded over and the ammonia levels are testing very high. The salesman at pet smart said to retest in 24 hours that it may correct itself as this is typical when starting a new tank. But I'm wondering if maybe we used to much of the starter and stress coat? We won't be buying any fish till its stable which leads me to my next question. What fish should a beginner get? The salesman said to add 3 fish at a time and get no more than 6-8 and one snail when algae starts to show up. But we truly don't know what fish to start with. Any recommendations? @Ava P - Yes, that is too much, and there many issues with that stocking strategy. The cichlid, rainbow shark and probably the algae eater - depending on what species- are all inappropriate for a 10-gallon community tank. The guppy should be in a school. Please re-reread this article and do additional research before stocking your tank. Good luck! I am thinking about getting a 10 gallon tank and I want to stock 2 green lantern platys, 1 rainbow shark, 1 female fancy guppy, 1 algae eater, and 1 jewel cichlid. Is this to much for my tank? @Matt - Some cories might be nice. They stay on the bottom for the most part. I wouldn't push it beyond that though. @aakash - If it were me, I'd stick with one. With gouramis there is always a chance of aggression, and you don't have enough space for a 2 female/1 male ratio. Adding only one female may be asking for trouble. You never know until you try, but personally I wouldn't. hi - i have 1 male dwarf gourami and 5 guppies. 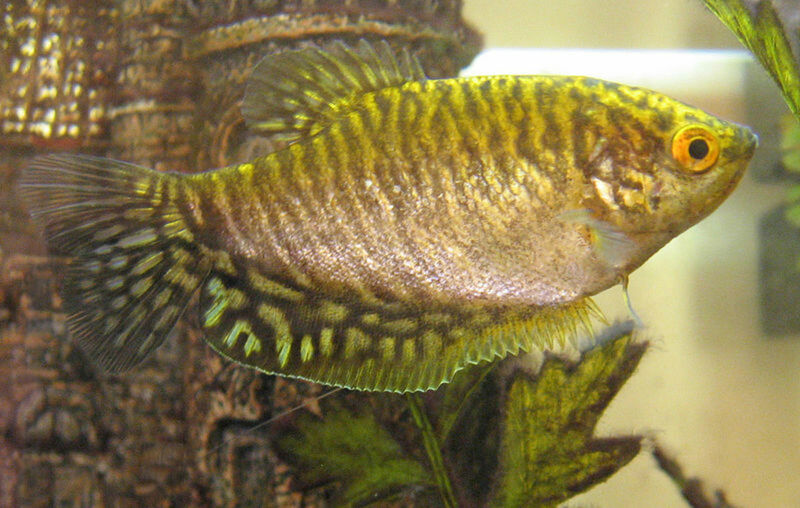 i am thinking on getting 1 female gourami. is this ok or is this over stocked. 10 gallon tank. Hi Ava - I would not put platies in a 3.5 gallon tank. I'd go 10 gallons or bigger for them. They are active fish and they need swimming space. Honestly, I wouldn't put any tropical fish in a 3.5-gallon tank. Five gallons and up for bettas; 10 gallons and up for everybody else. Hey, I know this doesn’t really relate to the article, but could I put platy’s in a 3.5 gallon? I’m sorry if this is a really stupid question! @Scott: Are you monitoring your water conditions? Are there any other fish in the tank? What size tank? It's hard to guess what's happening without knowing more about the situation. Help I've been trying to keep guppies alive it seems the fish we get come to our house to die... We had two males and decided to add four females and one male. Bought them Sunday only have one of my old males left. Hi Emma - You may wish to re-read this article. You should not put even one plecostomus in a 10-gallon tank. They grow much too large. The guppies and platies are fine. Good luck! Can I put two plecostomus, three guppies, and three platies in a ten-gallon tank? Would it be too crowded? @Tre - Like neons, guppies should be kept in small schools. 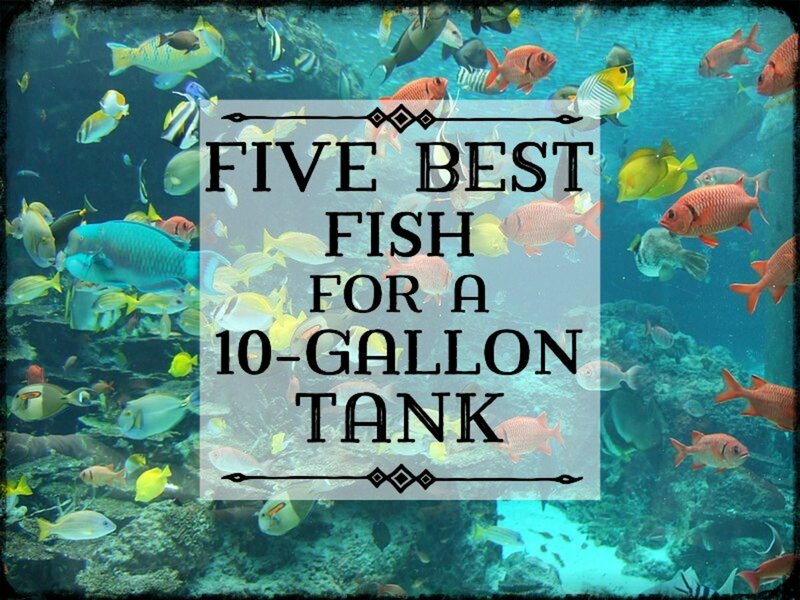 You'd probably be fine with five of each in a 10-gallon tank if you don't add any more fish. Good luck! I want to get 5 neon tetras for my 10 gallon tank.Can I add one guppie with them or should I get another guppie? @Mark: I don't think the gourami will eat the neons, but, as mentioned and this article, neons, cories and guppies and schooling fish that do best in groups of at least 5 or 6. I have a ten gallon fish tank and was wondering if this stock sounds good, 1 dwarf gourami, 2-3 cory cory catfish, and a couple guppies or neons. ill the gourami eat the Neons or guppies. IF so what better fish species will do better? Thanks Rose! You could have a couple of schools of cories in your 55 gallon. They're hard-working little bottom feeders. I would think about getting those angelfish into a bigger tank. They will grow much too large for a 10-gallon. Small tetras seem to struggle in tanks where conditions are less than ideal. If you really like them go for it. Size-wise they are a fine choice. I'd go with a small school of 5-6. Glowlight tetra are not good for a ten gallon? @Roz: Otos eat algae. You can toss an algae wafer in there once every day two to supplement their diet. I would not get more glowfish. Cories are a good choice, as are the otos. You may want to consider platies, zebra danios and swords. Just be careful not to overstock the tank. @Roz. I was in a very similar situation once in a place I worked. I know its a bummer, and where I worked, as hard as it is to fathom, it seemed some people where actually hoping for the demise of the tank. What I did was simplify the process as much as possible. The weekly water changes will go a long way. You can do a deeper cleaning once a month or so. Feed them a small pinch of food every day. You can put a pinch in a cup on Friday and maybe somebody will toss it in sometime over the weekend. They don't need to think about it any more than that. If they are unwilling to do even that it isn't the end of the world. The fish can survive weekends without food if they are getting it five days a week, though it would be better if they had food at least one of the days. Turn the light on when you arrive for your shift and off when you leave. It's not ideal but it will be okay. If nobody is willing to do that for the weekend again it's not ideal, but it is what it is. As for fish dying, learn as much as you can about which fish are best in the tank and replace them as they go. You'll eventually have a hardy stock. Of course the alternative is just to maintain the tank for the remaining fish and then get tear it down when they are gone. Or you can try to re-home them. Good luck. I know it's a crummy situation. Hi Shanna. Don't know but here are some thoughts: Both black skirts and neons are schooling fish that require a small group for security. If you have 10-12 of them they may feel a little crowded in a 10-gallon tank. If you have fewer than 5 of each they may be feeling some stress from the lack of other of their kind. Is there any cover in the form or decoration and artificial plants? Perhaps the light is a little too much for them. Do they eventually relax? Sometimes a sudden change in light can stress fish out in the short term. Hi Betta newbie. Not sure what you have going on there. Maybe some chemical lingering that the tetras aren't liking? Have you done any water changes since introducing the chemicals? This website is so awesome! I wanted to see what other cool kind of fish I could get besides my GloFish in my 10 gallon tank! Is 6 neon tetras and one nerite snail in a 10 gallon tank considered overstocking? @Amanda: If I were you I'd let things sit for a while, given the issues you've had already. I think it would be a little tight with more cories but not terrible, but that's considering you can get your water parameters under control for the long term. Hi there. Stocking question again.. We currently have 6 platies, 1 dwarf gourami and one cory catfish. Is that too many fish? We had so many issues with water parameters getting crazy that we lost the other cories :( We had only 4 platies, however one of the male platies was getting dominant with the other male so we needed to get a few more females to try to get him to simmer down. The lady at the pet store made me think it was too many fish.. because its too many inches? We are hoping that this last surviving cory makes it, however he still doesnt look great (coloring is very pale) so were waiting to see if things turn around for him before we get him more friends and we would like to ensure that the water parameters stay good so that we aren't just bringing more home to die. So, are we currently overstocked? 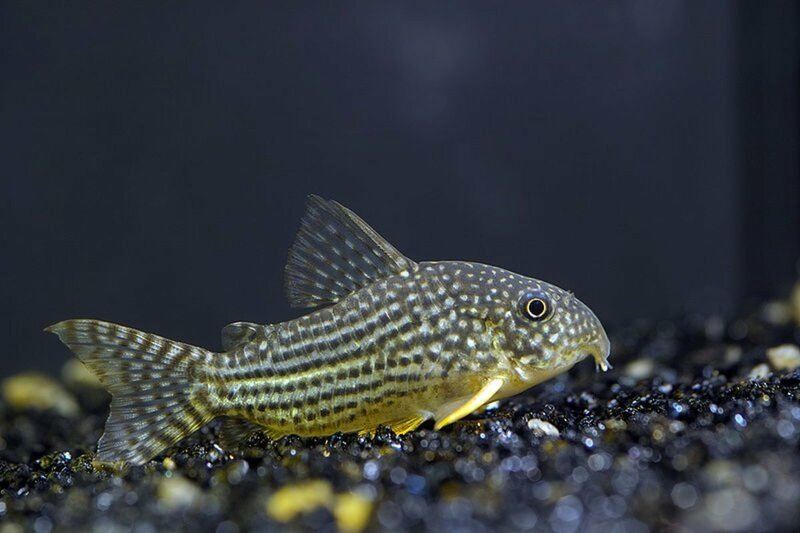 Would we be overstocked if our cory survies and we decide to get him 4-5 friends? Thanks in advanced for your input again! Hi Josh. Yes, my concerns were mainly water temp and quality. Pond snails are pretty tough little critters and I don't know that they are a great benchmark of water quality. I used to raise them in a small tank as food for my green spotted puffers and while I did my best to keep the tank tidy it was no environment I'd ever keep a fish. The snails did fine, though. I'm a little surprised you haven't had a snail explosion with all the algae, but I guess that's a good sign. If you feel you have a good plan you can always give it shot and see how it goes. I'm interested in hearing the results. Good luck! eric, that was a quick reply. i appreciate that. ive had this turtle for about 15 years now, in a 20g home. but only within the last 5 years i have been able to afford growing and expanding his tank, with trial and error too boot.. i got his 40g breeder tank with a $1 a gallon deal at a LFS, with a canister filter and it worked great then last year i picked up the 72 gallon tank for $50 yea it was a great deal. but the canister filter didnt like the 72g and kept flooding so with some quick research i came up with the 'fuge. i liked the idea of the more self sustaining environment, and if i had the space i would get that nice 180g tank using the 72g as a fuge that i could habitat live bearing fish in for feeders. you voiced concerned about the environment, did you mean cold water vs tropic or the possability of pollutants? if its temp wise, i plan on switching my tank heater to the smaller tank with the theroy that because the water moves fairly slow through the fuge it should hold the tropic temps better and balance out, if its pollutants i have about 6 or so common small pond snails from a neighbors molly/platty tank and they havnt died yet so im hoping the water will hold fish. though im pretty sure these snails are the equivalent of a cockroach in that it can survive a nuclear blast haha..
anyways i know i discussed a few advanced topics for a basic article, id still like to hear a little feedback if possible. thank you very much. Hi Josh. First, great point about the real estate issue. This is one of the reasons I think it is important to consider the needs of the fish we are stocking as well as the environment we intend to create rather than simply going by tank size. As for recommending algae eaters, I think the otos and shrimp are a good idea. I'd think you'd want to avoid even smaller pleco species because of the plants. But, a little army of otos might do just fine. However, I'm a little concerned that this environment might be a bit too rough for tropical fish. They'll make some impact on the algae, but you're still going to have to do most of the work yourself to keep it clean. I'd put some thought into whether it is worth it or not to add them in there. You seem to know what you are doing, and obviously it is your decision here. Good luck! i have a 40g freshwater planted refugium that is the filter for a 72g bowfront turtle tank, the single turtle has a single goldfish friend (was a feeder fish, now the size of a decent pork chop). the planted tank has been running for about 4 months now so its well cycled and the plants are growing well and some (dwarf grass hairs, moss plants) have runners growing and spreading out. can you suggest what i may add that is compatible. id like to keep it simple with 1 or 2 species, example: 4-5 dwarf otto cats and 3-4 shrimp. also please take into consideration that this is in essence a "sewer system" for the turtle and though the plants are doing a good job, they have to be kinda hardy incase a random spike happens. ps though great article, you didnt talk about real estate issues vs decoration.. i have seen some 10g tanks that have the infamous "bubbler boats" that turn that 10g tank into a 7g tank, and most people still account for 10g of living space when trying to plan species placement. @solefish: Seems okay, but I'd think of having a slightly larger school of cories. Good luck! I'm thinking of stocking my 10 gallon tank with 5-6 ember tetras, 2-3 Cory cats, and 1 dwarf gournami. Does this sound overstocked? I'm thinking of stocking my 10 gallon tank with 6 ember tetras, 3 cory catfish, and 1 dwarf gournami. Is this too much? @Amanda: Regarding the cories: Whether you replace them or not is up to you. If you decide to keep them, again, they should be in a small school, all of the same type. I'd concentrate on ONE type of cory and have at least 5 of them. Hiding is what cories do when they aren't looking for food. It's a defense mechanism. They don't know they aren't going to be eaten in your tank. :-) You can make it a game to "find the cories" in your tank to make it more interesting for your son. Live plants can help, but you have to take care of them like you do fish. In a small tank they will need to be trimmed back to avoid them taking over. I've always liked Amazon Swords, but they do get somewhat large. Whether you choose male or female for your 2nd dwarf gourami, they may or may not get along. That's why I advised above to have hiding spots for one fish to escape if the other becomes very aggressive. If you want to avoid that drama altogether, stick with one gourami. First, we currently have no live plants.. should we? I read that both dwarf gourami and platies like them and they can help with the water parameters. If so, what do you recommend? 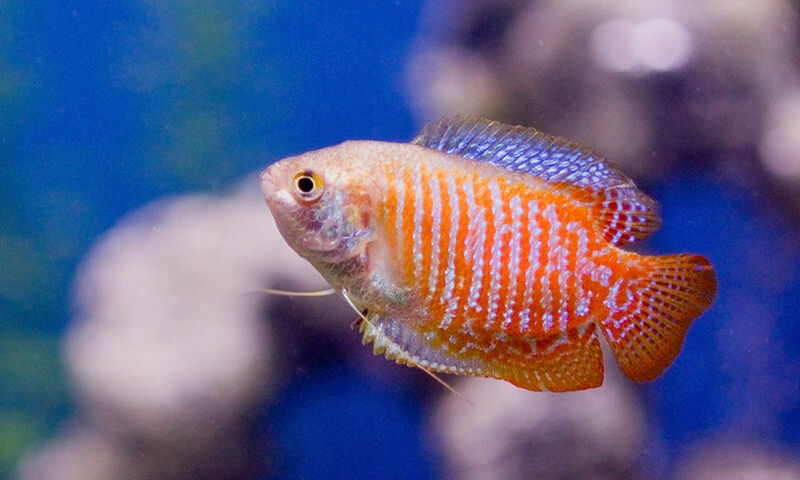 Lastly, if we decide to get a second dwarf gourami does it have to be the same kind (powder blue)? Ours is male.. female best for the second? Thanks again we really are trying! Any input is appreciated as we are newbies and don't want my son to have to deal with losing more fish (at least not for awhile)! Hi Amanda. Again: Cories, guppies and cherry barbs are schooling fish and should be in groups of 5-6 minimum. My advice is to make your decision based around that. I can't advocate having only 3 of any of them in a tank. Depending on what other fish you have in the tank the frogs may struggle to get food. I always used a mix of sinking pellets and flake food. Hi again Eric! Thanks for your input. Our tank was ready.. water tested great so we got a few fish yesterday... 2 cories and 3 guppies to start and I think we may stick with a school of guppies and a school of cories, although I still love the idea of a couple barbs too. We decided against the frog because not only were half of them dead in the tank they were in (they said they just came in yesterday and it happens like that from the stress from moving), but the lady said that often times you have to essentially hand feed them or the fish will just eat their food and they'll starve. Anyways... to my question... We were thinking like 6 cories and 6 guppies.. or could we do 6 cories and 3 guppies and 3 cherry barbs? Is that too much? Also, is it okay to mix species of cories? what about guppies? I've found mixed opinions online about this.. some say yes, some say no.. the lady at the pet store said yes... We currently have a julii cory and a sterbai cory, a fancy guppy, a yellow guppy, and a red-gold tuxedo guppy.. We were planning on going back sunday afternoon to get a few more. Appreciate your thoughts since I'm a total newbie. Hi Amanda. In my opinion that's too many fish for a 10 gallon. Also, the guppies, cories and cherry barbs are shoaling fish, which means you need 5-6 of them minimum to keep their stress levels down. Dwarf gourami can be aggressive (I know, the pet stores say they aren't) and I'd especially be concerned with them and the frog. The frogs tend to sit at the top of the water where they can be easily picked on. I'd consider paring this down to either a school of cories and a school of cherry barbs or guppies. You could maybe add the frogs or the snail as well, but not both. Or, go with the cories and a pair of a dwarf gourami. It really comes down to understanding the needs of the fish and pairing them accordingly. Thanks Eric for your input! Still messing with what to do.. I like the idea of variety. I think this is too many... we wanted to stay under 10. But so far this is what were thinking... 2 cory catfish, 1 african dwarf frog, 2-3 fancy guppies, 2-3 dwarf gourami, 2-3 cherry barb, 1 gold mystery snail... thoughts? Any no-nos or conflicts in our choices? @Amanda: If you go for cherry barbs I'd think about a school of 5 or 6. . They school loosely, and they are somewhat active. I had a school in a 55-gal semi-aggressive tank and they worked out very well. One of my favorite fish. Instead of the pleco consider a small school of 5-6 Otocinclus catfish (otos). Like plecos they stick to the glass and eat algae, but they are tiny, only about an inch or so in length. But, remember, the ultimate job of cleaning up algae goes to the tank owner. Fish can't do the job all on their own. If you had the cherry barbs and the otos that would probably be the limit for a 10-gallon. Both are schooling fish, and so you'd need 5-6 of each. We were looking at a cherry barb? We would get a couple.. I have heard they're super active once they get comfortable. Is that bad idea for such a small tank? Also, since pleco is a bad idea for a small tank (my hubby was set on this one) is there another that will clean up like it would? Thanks so much for your input. My father in law had a huge salt water tank for a long time so my husband has had fish before, but I've never had a fish before.. so I have no idea what I'm doing! @Amanda: African dwarf frogs are small and relatively easy to care for, and do well with most community fish. Colorful fish would include neons and other similar tetras, fancy guppies, dwarf gourami. Good luck with your new tank! Hi. We are in the process of setting up a 10 gallon freshwater tank for my 3.5 year old. (Don't worry.. we will be caring for the fish!) We want colorful, pretty, active fish... my son really wants a little frog (they had them at the pet store).. recommendations? I like the idea of variety... we plan on possibly upgrading if all goes well..
Hi Will. You're stocking sounds fine to me. As for mixing tetra species, it depends on what you mean by that. Will they get along? Probably. Will they have the reduced stress that comes with living in a school if there are only a few of each? Maybe not. That's why I always recommend 5-6 of each species. You may wish to stick to either one school of tetras or a small group of fancy guppies. That's my opinion. Good luck! @Fishnewbie: Your tank might be a little tight, but especially with the live plants I think you're okay. However, keep an eye on the Amazon sword. You'll need to keep it trimmed back as the typical size is a little too large for a 10-gallon tank. If you don't want to refill your tank with the tap water you can still use a gravel vac to clean the substrate and simply send the water down the drain or outside. You'll then need to refill the tank from another source, such as bottled water. It's not terribly bad with a 10g as a couple of one-gallon jugs of water equal a 20% water change. Just make sure you test your new water source, even if it is bottled water. I really appreciate your post about the fish types for a small tank. I did have 2 questions I'd like your help with. 5/6 Cori's and 2 fire dwarfs and a mystery snail with live plants such as Amazon sword and ferns... Is this too much and over stocked? And two. when doing the water changes what do you recommend for getting the "junk" off the substrate without disturbing the needed bacteria and such in a cycled tank? My city water is very hard and the conditioner doesn't seem to help much. Any advice or pages you can point me to for some much needed knowledge? Thanks for your help and post. It's appreciated. @Tim. The fish I recommend are outlined in this very article. Check it out. What fish species would you recommend for a 10 gallon tank? I have a 10 gallon that has been running for a few weeks now, and it's got some dwarf hairgrass and other plants growing in it. Looking to add some fish now, and would love any advice on what type and how many to put in there. If possible I'd like to have some small bottom feeders from the catfish family, maybe some ghost shrimp, and some small, pretty schooling fish like guppies or neon tetras to swim in the middle and top of the tank. Would this combination of fish work? If so, how many of each? Thanks! Hi Mickey. They should be fine together. I wouldn't have more than 5 of each in a 10-gallon tank, and no other fish. Hi, Can neon tetras and Guppies live together? We have a 10 gallon tank so how many can be housed inside? @Nyeesha. You need to do some research on how to properly cycle a fish tank. There is more to it than letting the tank run. It is also wise to spend a few bucks on a water testing kit so you can monitor your water parameters. Thank you Eric. When you say cycle the tank,do you mean let it run for 24 hours? I definitely did not do that so I imagine it would probably make a big difference. Is there a certain amount of fish I should start with? Hi Nyeesha. This article has my best advice for stocking a 10-gallon tank. There are a few more things you should think about though. Did you cycle the tank before adding fish? Did you test your water source to make sure it is safe and then treat it if necessary? Before you add any more fish I would make sure you are addressing these basic things. I recently had bought a 10 gallon tank. From the suggestion of the petsmart employee we had a pleco and a black molly and some other kind of fish that I don't remember but anyway all the fish died. All the fish we have ever put in the tank died and we are not sure why. Is there any suggestions you can make for beginners about what fish to start with and how many to start with? Hi Madelyn. I don't think your tank is overstocked right now, but you have made some odd choices. Please learn a little more about the types of fish you wish to have in your tank before buying more. 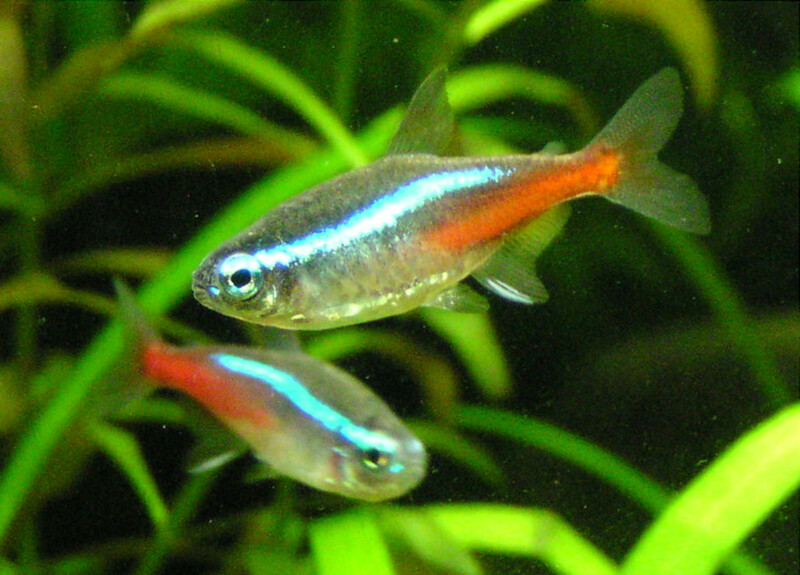 The tetras (both black skirt and Buenos Aires) are indeed schooling fish and should be kept in a group of 6 each or more, which you do not currently have the room for. We all make stocking mistakes when we are first starting out. Just learn from your mistakes and it won't happen again. Good luck! Help! I think I overstocked my 10 gallon. I have: 1 dalmatian molly, 1 dwarf fire gorami, 1 red wag platy, 1 black skirted tetra, 1 orange Molly, and today I just bought 2 Bueno Aires Tetras on the account of a fish seller at petsmart who said with my situation I should get them because my tetra is a schooling fish. A couple of silly questions: What did you use to clean the tank? How did you to the transfer from what the fish were in to getting them in the tank? Hi LB: Sorry about your fish. When fish are coming from an abusive environment it is sometimes hard to guess what might be wrong with them. It sounds like you did many things correctly, but one thing you didn't mention was whether you cycled the tank. However, when your fish reacted so quickly to the tank water it makes me think there might be something off with your tap water. Or, in your process of cleaning the tank.You need to be sure there are no chemicals or detergents in the water, including chlorine. Sometimes tap water can include all kinds of things that are "okay" for humans but deadly for fish. Maybe it would be a good idea to have your local fish store test the water and see if it is safe, or ask them if they have heard of any other issues with tap water in your area. I currently have a 10 gallon fairly planted, it currently has a betta and 3 corys. I think bettas can go with others at that stage but you really have to know your fish and provide plenty of hides and keep your stock smaller than you would with other species. since bettas are primarily top swimmers and corys bottom ones, they don't bother each other much. 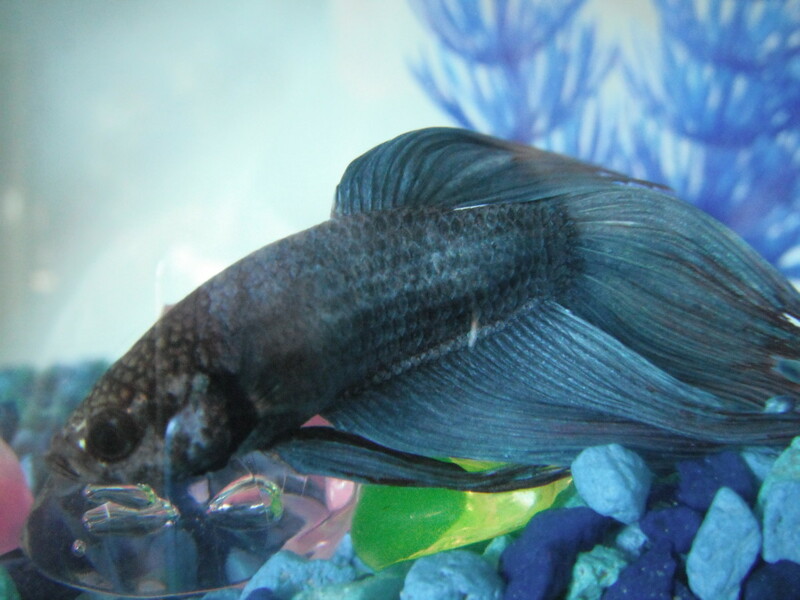 I'm especially lucky because my betta has a very mild temperament which I knew going into placing him with others... I've seen him let the corys rest on him or run into him and he doesn't chase after. 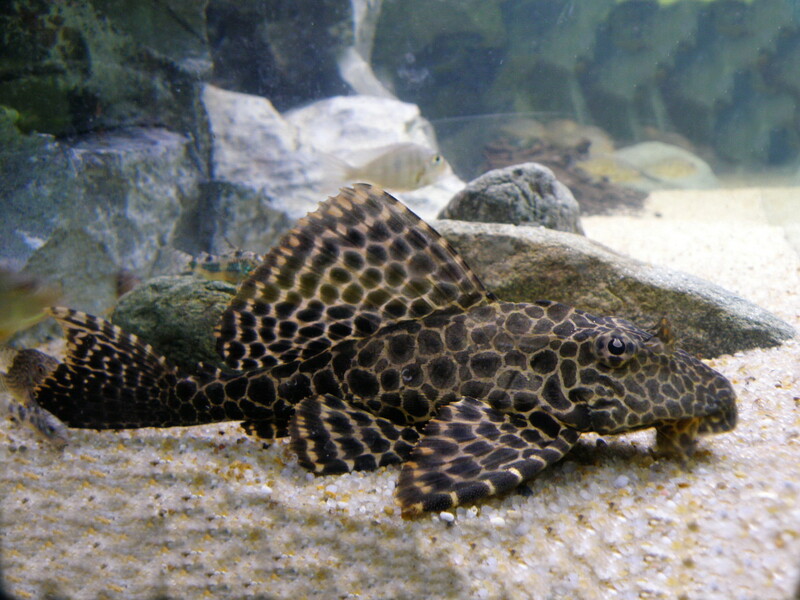 @Yoyo: As I said in this article, you should not add a common pleco to a 10-gallon talk. They grow much, much too large. Consider a small school of otos instead. Can I put one single small-ish pleco in my ten-gallon. I was hoping I'd be able to add some tetras too. Hi Jonathan. It depends on how many of each you are putting in there. Ideally, cories should be in small schools, if you have six of them plus 4-6 guppies and a pair of dwarf gourami your tank is pretty well stocked. If you stock fewer cories and guppies you can have another small school of neons or something. Remember with a 10-gallon tank it is really easy to overstock so I always err on the conservative side. Hello Eric, great post. Helps beginners like myself a lot! I currently have a Crown Tail Betta in a 2.5 ga tank, and love it. I plan to add a 10 gallon tank. What would you say would be a good distribution of the following fish you mentioned? Can you recommend adding one more to the above list? Sounds nice, FishMom! It will be getting a little tight if you intend to have 16 small fish besides the Betta, but you seem to know what you're doing. Live plants help a lot. Good luck with your pretty little 10-gallon!